naijablog: What every (Nigerian) woman wants..
Woodin is the epicentre of the Nigerian woman's dreams in Accra - heaven being unlimited time and credit in the shop. Any society wedding worth its salt involves trips to the fabric mecca of Ghana. Woodin's own brand cloth is similar to dutch-wax but slightly thicker and rougher in feel with trademark design patterns. The shop sells Woodin, dutch-wax and indigenous wax-cloth. The only discernable difference between the last two being that the former is made in Holland and much more expensive. A sign of Nigeria's complete economic dominance over Ghana is the fact that the shop is always full of Nigerian women (shopping for that up-coming owambe). I wandered round and I heard Yoruba in every corner. A woman by the name of Dupe with a hard face and a voice deeper than mine perused the shop in furious concentration. Other women shopped in groups, yard after yard of fabric stroked, surveyed and purchased. We bought six sets of six-yard wax, all for under US$100. The Nigerian in me purred. Woodin is top quality stuff. As a man of "African Shirts", I know my Woodin. Let me not lie. My last trip to Ghana I was unable to get some and therefore sent my husband a few days later to get me aome woodin, can you believe. He was sooooo confused when he got there tht he called and said I should come back and get it myself. He has bought me a ticket to go back for it. It's like going to a candy store and just not knowing where to start. Yipeeee. Oooh, I love my Woodin. We always got ours from Abidjan or Cotonou. 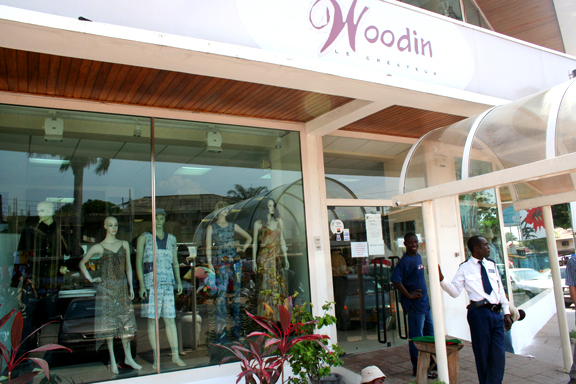 Why isn't there a Woodin store in the whole of Nigeria?